Pre SIHH 2013, A. Lange & Sohne GRAND LANGE 1 Lumen is a ‘limited edition with a semi-transparent dial that shows the wonderful mechanism of the Grande Date illuminating slightly. The Big Date is a complication and unmistakable signature of Saxon watchmaking, played by Maison Glashutte in a version with a middle finger to split and hide the central point of coincidence of the two disks that are used respectively to score tens and units. On the dial, the classic decentralized arrangement of hours left, the Great Date in the upper right and lower the continuous small seconds, showing the Grand Lange 1 in “Lumen” figures indexes and hands coated with the same substance highly luminescent A . Lange & Sohne showed us earlier this year (SIHH 2012) in the new Lange 1 Time Zone . Grand Lange 1 Lumen but this is a limited edition of only 200 copies, the fact evidenced by its platinum case. To expose the underlying mechanisms, the dial is made of translucent sapphire treated fume’. Only the peripheral ring, as well as indications of hours, minutes and small seconds are in blackened silver. The sapphire glass surfaces make visible the mechanism drives the Big Date, as well as the hours and the battery back that glow in the dark. The technical challenge in the development of the Grand Lange 1 “Lumen” was to ensure the ideal brightness indication of date soon after a process of progress daily. 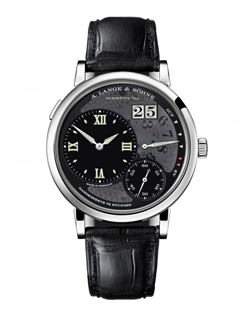 For this purpose, the designers of the Lange watches have devised a particular solution. On the cross the dozens and filed a luminescent substance and white on this printed black numerals. The record of the combined black-and instead made of transparent glass and wheel on a back ground that is illuminated at night. The particular coating of the components of the sapphire crystal dial blocks most of the visible light, but does not represent a barrier to ultraviolet light. In this way, the UV rays can penetrate unhindered on the surfaces of Big Data that lights up at night. It also helps to see the finish date of the plate decorated with perlage hand and small gears that animate it, which would otherwise remain hidden under the dial. The Grand Lange 1 Lumen mounts Calbro manufacturing L095.2 hand-wound before it is slightly illuminated the darkness. Introduced since last year by A. Lange & Sohne Grand Lange 1 line, exactly the eleventh Caliber developed by the manufacturer, has been deprived of a barrel of charge to be able to taper to 4.7 mm. Its power reserve of 72 hours remains. Provides indications of hours, minutes, small seconds and power reserve Grande Date. It has the rocker arm adjusting to single gooseneck. End execution of Haute Horlogerie Saxon, after the Lange 1 Time Zone clock A. Lange & Sohne Grand Lange 1 is another proof of how in manufacturing seems to Glashutte taste will start to try to play with light effects to highlight their mechanisms. It is a preview SIHH 2013.